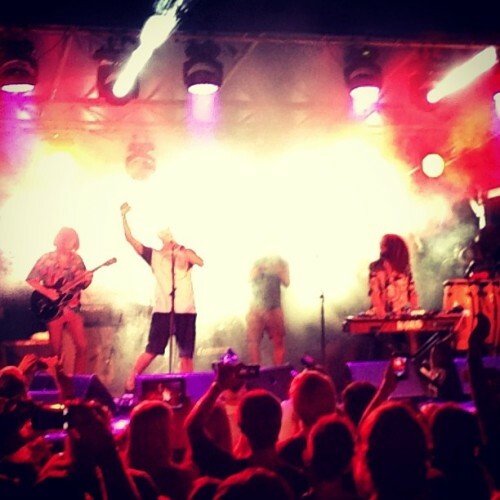 This weekend, Wolfmother put on a special performance when they played at a party organised by Joel Parkinson, an Australian surfer who is the current ASP (Association of Surfing Professionals) World Championship title holder. The bash, affectionately referred to as the “Parko Party”, was organised by Parkinson’s sponsor Billabong and held tonight (January 19th) at the Rainbow Bay Surf Lifesaving Club in Gold Coast, Queensland, housing approximately 1,000 invitation-only guests. Wolfmother were the main musical attraction of the night, performing a short set and even duetting with Parko himself for a song or two. Aussie folk band The Beautiful Girls also performed at the event. Photos courtesy of Troy Vandermeer, The End Collective, and Hayley O’Sullivan.